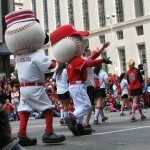 Here are some pictures from the 93rd Annual Findlay Market Parade. 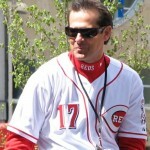 Aaron Boone smiling to the crowd. 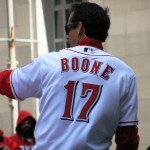 Aaron Boone responds to a fan. 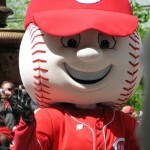 Mr. Red had some plastic surgery and lost the alien eyes. The old mascot with the new one. Rosie takes a break from walking. 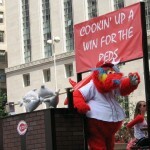 Gapper doing some pre-game tailgating. 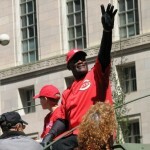 George Foster waves to the parade crowd.